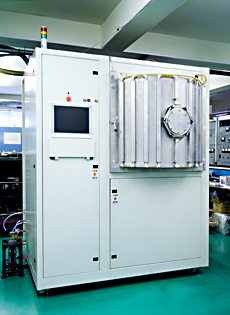 Ion Implantation System | Thin Films and Surface Modification | ShinMaywa Industries, Ltd.
What is Ion Implantation System ? Ion implantation is new surface treatment technology where surface layer properties can be modified without shape change. Ion implantation treatment can increase surface layer hardness and decrease friction coefficient, thus providing wear resistance and thermal resistance improvement. Can be applied for forming metal mold of the painted steel panel, as it contributes to the production efficiency. The production efficiency here is "improvement of the yield" and "decrease in maintenance time". There are the examples of successful applications for cutting tools, punches and metal molds too. Please feel free to contact our representatives and we will be happy to assist you with appropriate surface treatment selection for your specific tasks. Trial treatments are possible as well.